WOW!!! 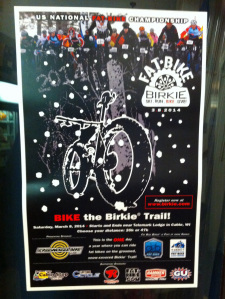 The 2014 Fat Bike Birkie Race held a Cable, Wisconsin, USA, on March 8th was the BIGGEST FAT TIRE RACE ON THE PLANET and the US National Fat Bike Championship, with over 535 registered racers (3/4s on the 47 Km loop and the rest on a 20 Km loop), including 100 women! Everything about the weekend, from hosting, coordination, facilities, accommodations options, restaurants and after race party local hang out and the sea of sponsors was superb! Awesome Tom, loved the footage. Do you guys get together here in Winnipeg at all? Looking for a group to ride with. Thanks David. Sorry I didn’t see your comment sooner. Definitely ways to connect with Fat Bikers (our MB Fat Biker’s were irregular this year with weekly rides for a variety of reasons). In only it’s second year, the Fat Bike Birkie Race has exploded onto the bike racing scene and it’s racer limit of 500 is about to be capped! 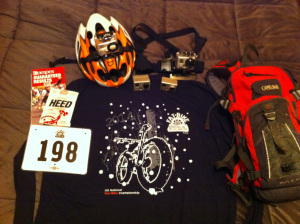 Thanks to some nudges from fellow fatbiker Jason Carter and kind offers of lodgings on site from our very own Manitoba cycling legend Lindsay Gauld (and Lynne of course), I am signed up to race (ok, while still mending a bit, I will mostly focus on video capturing this spectacle of fattie racing utopia!) … with 500 fat bikers – WOW!